During my first year in JNJ with my batchmates! Shall I say, this is it? Well, it’s an absolute yes. :) After a couple of months of contemplating about leaving JNJ – the most admired pharmaceutical company in the world, after talking about it with my mom and convincing her of my plans, after building two small businesses to start up my road to entrepreneurship, after emotionally and mentally preparing myself from the uncertainties of the future, be it good or bad, and after standing firm of pursuing my ambitious dreams, finally, I already tendered my resignation last May 12. Yes, I am leaving a company a lot of people dreamt of being a part of. It was really a hard decision to make because it seems like I am in an organization that already helped me fulfill my goals. From family responsibilities, job security, financial stability, etc., it leveled up my economic status and seems to make life easier and more fun. 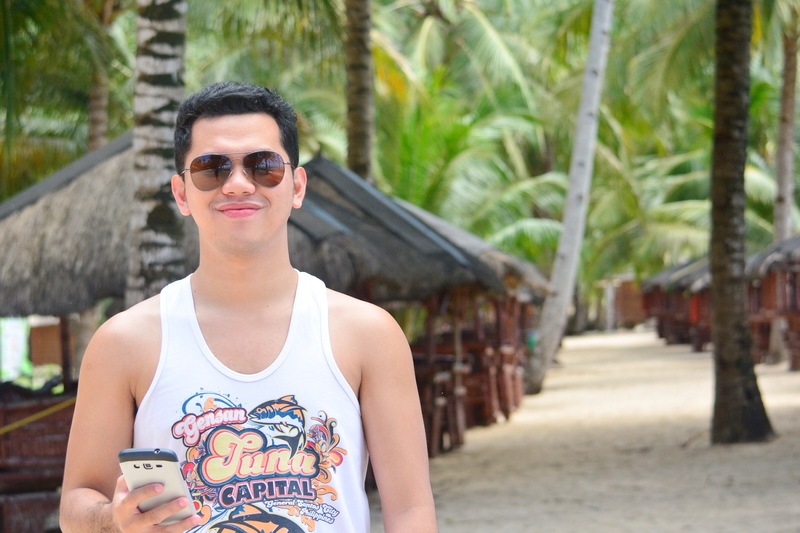 I was able to travel to different places, experienced a few luxurious vacations, tried low-budget to expensive restos. I was provided a car that I can use even for personal na lakad, free unlimited data on my iPad, etc. It’s like my sahod is all take home money. We’re well provided by the company that’s why I couldn’t ask for more. And it’s rare to see companies that care for their employees like the way JNJ is to us. But there are things talaga that you have to give up to pave way for another opportunity especially if it’s your dream that you want to have its way in your life. Don’t get me wrong by thinking that I am not contented with what I have. It’s not the point. Well actually though, I also thought about it before – that maybe I am not just contented with all I have. However, I’m pretty sure it’s not. Hehe. I am always grateful with JNJ because I don’t have all of these years before. It’s just that, I am really firm about making my name in the business world. I always wanted to be an entrepreneur since my college days. Kaya I am willing to start all over again. If it’s the price to pay, I will whole-heartedly face it. In fact, for the past couple of days, I am already planning my next move because, in around one month, fixed income will never be my thing anymore; though on the bright side, 8-5 job will also not be a thing to me (sometimes, it’s 10-10 haha). Yahoo!!! Honestly, it makes me quite worried to think how will I then support my parents (they’re my dependent). I wasn’t thinking about myself because I know I can always find a way for myself. Kaya lang sila, they’re not getting any younger. Soon, both of them will be senior citizens. They have maintenance medicines to sustain and of course, they’re more prone to diseases (knock on wood). But for the record, I bought them medicines good for a year. I hope and I pray (really hard) that it’s enough to buy me time to get a momentum for my business so that whatever happens to us (knock on wood, again), I am financially stable already. On the other side, I am very excited for every tomorrow. Finally, I can do what I want!! Haha. I can start making my ideas a reality. In fact, I have a lot of business ideas that I wanna do since 2015. It was just difficult for me to manage my time. (This made me realized that I am not a multi-tasker, hehe). Pero ngayon, I have all the time. No reasons not to make it. Also, I have this urge to hire people who are undergraduate and looking for a modest job. Ako naman, makita ko lang yung dedication matuto, I will patiently teach them. If they deserve the job, I will hire them so they can also fulfill their family responsibilities. Honestly, kapag nakikita ko mga kapatid ko at mga kapit-bahay namin na walang trabaho pero gusto magkatrabaho, I always wanted to help them by creating businesses where I can offer them opportunities. I wanted them to feel hopeful that life could be different if they have decent jobs. I don’t want them to be contented with ‘isang kahig, isang tuka’ mentality. I really believe that each person has capabilities yet to discover, maybe not as decorated as others but at least, it can help them improve their lives. Well, it’s simply in what’s gonna happen after the goodbye. Personally, I am excited with this goodbye. I am positive of all the opportunities to come, especially this time that I am seeking for opportunities based on the dreams I wanted to achieve and based on things that I wanna do. Taking a leap of faith..
For the past few weeks, I’ve been thinking of taking a leap of faith to create some ‘major’ changes in my life and my plans. It somehow puts me pressure of how will I make things right when I am afraid of trying something different. It’s been one hell of a ride trying to accomplish in a field I believe, right now, will not make me uncover my full potential. Of course, I know that this will not be any easier, but hey, what else is easier in this world other than dreaming of nothing? Yes, I am referring to my career as a salesman. Two out of the three years I’ve been in this field, I have delivered with flying colors my annual objectives. This year, I am on track in repeating the victory again. I have fair compensation and benefit. Satisfied with sales incentive. I have free mobile and internet plan, with car, etc. However, job satisfaction isn’t always about those things. More importantly, it should conform with your personal and professional goals in life. And right now, I feel like being lost in the corporate world. So I want to be out – to find myself again. I have come to the decision where I want to try something else, something new that I have never tried before at this point of my adulthood. But I know that I still have commitment I need to accomplish for the year so I am still delivering what’s expected from me. I know that for as long as I haven’t tendered my will to leave, I am bounded by the responsibilities expected from me. Moreover, I want to exit in and with grace. But the decision is already final. The good thing about coming up with such decision as early as this month is that it gives me more time to just do the job without feeling the much pressure when you are controlled by it. It’s like making the most out of the remaining time you have. You know something will be lost so you just enjoy everything in between. It’s like that. You feel lighter and almost worry-free – not to withstand the fact that no matter what I do, I am leaving anyway. I could have done this a year ago but I am bounded by the concept of my role in family responsibility. I was frightened to take the risk of losing a job by having nothing to support my parents especially that they’re not getting any younger. I was also frightened by the pressure of being a role model to the young ones in the family. ‘Kaya napostpone ng napostpone until such time na hindi ko na kaya magstay.’ I still believe that I can still live up to my responsibilities despite taking a different path. I still believe that I can make myself composed again from a fall – just what I always do from the past. I don’t wanna be a slave of the corporate world, of a job, of money. I don’t wanna be like those who can’t afford to lose getting fixed income every month. I don’t wanna be like those who complains about their bosses yet do not want to leave their team. I don’t wanna be like those who only get by the day but not living to it. I don’t want the day to come when it’s too late to try something new because I’ve got bigger responsibility to play. I don’t want life to run away from me because I have no time living a good one. I want my day and the days to come to be simply a story of my life well lived, with no regrets but pride. A manager once told me that sometimes, what people only need is just a leap of faith. I am taking a leap of faith of going out of the box despite assurance of nothing. But that’s what life is. No one knows what might happen until he tries. So I am trying. The photo above was a picture of the Johnson & Johnson Philippines President and Managing Director, Jeffrey Go, talking about my favorite CEO, Jack Welch. 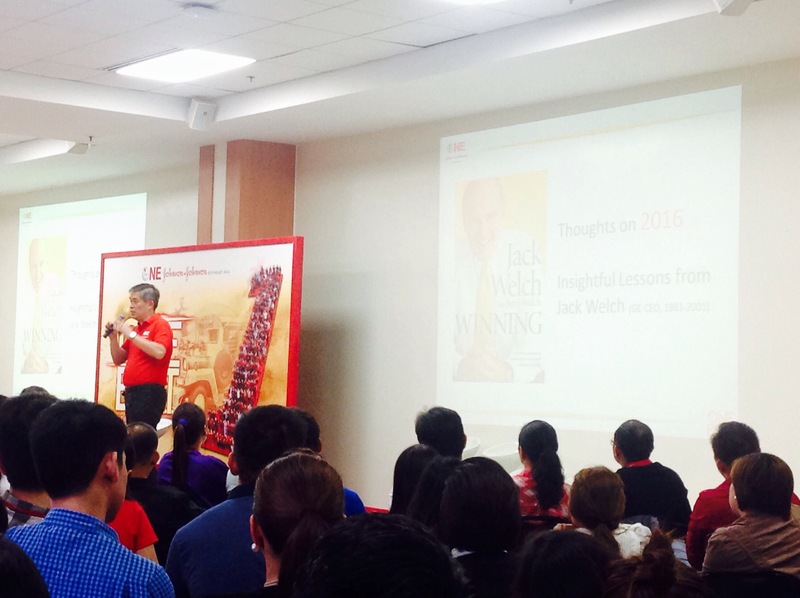 I felt compelled to post this because Jack Welch indeed deserves the coin CEO of the Century and to learn his principles and his way of thinking will actually ‘force’ you to perceive and analyze challenges and opportunities in a whole different way. One of the great lessons I learned from his book Straight from the Gut is taking a deeper look at the market we play. Relating it to a bigger general idea, it simply means going beyond and deeper what and how we perceive current key achievements we uphold because although we say that it is already an achievement (or something that we thought have already penetrated and tested or tried to penetrate and test but only ensue to negative unsatisfying result), we might only seeing a parcel of a bigger chunk. So he encourages people, especially the leaders in their specific organizations, to change the way we look at and analyze things so we can grow sustainably through broader opportunities. The best example of that during his early administration in General Electric was his Number 1 and Number 2 strategy where he only retain businesses that were market leader and a runnerup. In a most surprising way, a marine (I guess, but it was an army man) tested this strategy and ‘belief’ telling that being number 1 and number 2 might only been based on how they define market shares of number 1 and number 2 and the total market without looking at the truest, most realistic and bigger battle field. As a result, the once thought a bigger market share shrunk into smaller one, thus, a greater opportunity for them to grow and a bigger potential for businesses to serve more peole. Right now, I might not have applied it yet with a tangible result but I know that the principle has transpired upon me that I believe is very useful to the way I will see and analyze things. I might not have implemented my thoughts now, however, I am confident that later on in life, what I learned is more than lessons I learned from many years in academe and in the workplace. This is, indeed, perspective-changing! I highly recommend Jack’s book to be one on your shelf, especially to managers and those who desire for a higher position. As Warren Buffet commented, his books are like crash course to management. 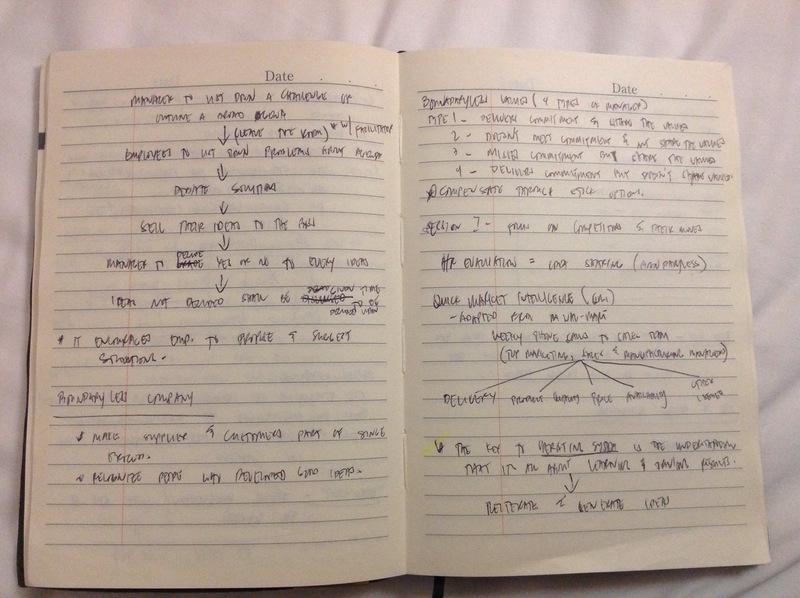 Below is sample of my notes because I was so eager to learn the way he thinks and how he look at relevant things. One of these days, I’m gonna read it again so I can refresh and understand it better before buying another of his books.